I left Pink Flamingos sitting unwatched on my computer for at least six months before I finally let it roll. I had heard a few rumors, a few tremors of delight, a few murmurs of disgust, but really I knew nothing about the film. All I knew was it would take a very special occasion to watch it. I needed to be in exactly the right mood. So I waited. And waited. And waited. And waited some more. 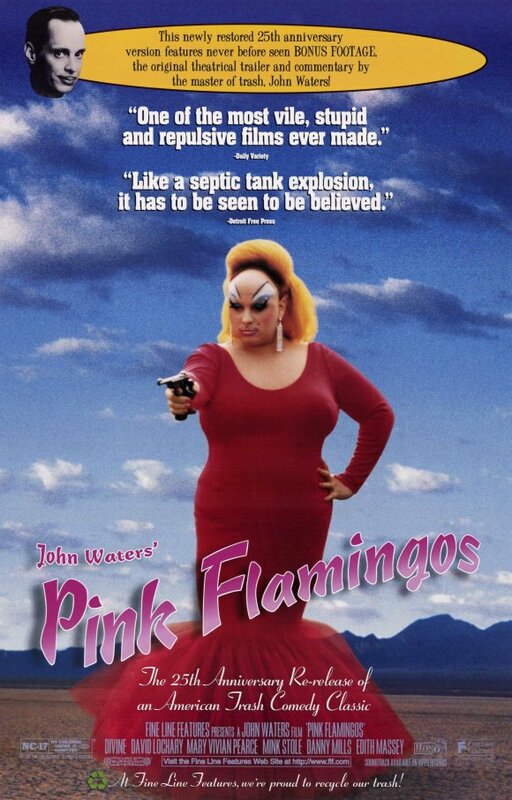 I’ve seen many (too many) movies over the past six months, but Pink Flamingosremained sitting, waiting, and untouched. Then, it happened. Maybe there was a strange breeze that blew down from the North, or maybe I was just feeling a little mentally ill, but whatever it was, the feeling smacked me in the face like a bushel of rotten oranges. The video crackled to life and I maneuvered my derriere into a comfortable position. Basically, there is no proper way to describe this film. I have seen a lot terrible things in my short stay on this planet. I’ve even participated in a few (har, har, har). But nothing, NOTHING will prepare you for Pink Flamingos . It receives its extremely high rating of 9.5 because it is wholly original, completely insane, and ONE OF THE FUNNIEST MOVIES I HAVE EVER SEEN. Well, perhaps that’s a bit of an exaggeration. Perhaps your friend won’t be driven to murder you if you disagree on the content. BUT IF THERE WAS EVER A MOVIE THAT WOULD INSPIRE MURDER THIS WOULD BE IT.